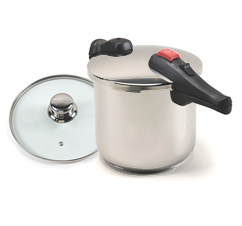 We are pleased to offer our largest Chef's Design Pressure Cooker, with a 10.6 Quart capacity and a quality 18/10 stainless steel construction. It's mirror-like finish will last for years as a staple in your kitchen. Heat-resistant handles provide safety, and two automatic pressure regulating weights at 7.6 and 11.6 psi make cooking at standard and high pressures a snap! Finally, a sturdy aluminum and steel base provides even heating and prevents hot spots. Add this wonderful appliance to your home and transform your cooking! This 10.6-Quart Chef's Design Pressure Cooker is the perfect cooking tool!